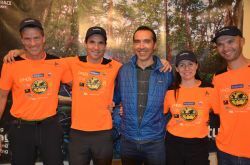 The opening ceremony and team check-in for the 13th edition of the Patagonian Expedition Race took place on Saturday, November 17th in the Teatro Municipal in Punta Arenas. It was an intimate, warm gathering. The Teatro is an elegant building, rich in history, with cream coloured walls and chandeliers. The race organization had set up one of the race’s large tents in the middle of the room and this tent served as the registration and check-in space for the teams. After check-in, teams proceeded to the second floor where the opening ceremony began at 20:30. The room was decorated with massive canvas prints of photos from previous editions and a wooden podium that volunteers had created especially for the opening ceremony which served to present each team. The ceremony began with the projection of a short film with footage from previous editions. The race director, Stjepan Pavicic, then gave a speech welcoming the teams. He spoke of the passion with which he organizes this race, of the difficulties of not having corporate sponsorship or government funding. He also pointed out that the fact that the race continues despite the immeasurable organizational difficulties is a testament to the almost mystical pull that this race holds. Two teams that would appear to respond to this mystical pull are East Wind from Japan and Bend Racing/YogaSlackers from the United States. This edition will be the sixth time at least one on the team has raced PER; both have raced in 2010, 2011, 2012, 2013 and 2016. These two team's captains were called to the front of the room to speak about why they keep returning to race the Last Wild Race. East Wind’s captain, Masato Tanaka, was noticeably absent. He’d had to fly back up to Santiago to get the teams’ bikes through customs. His three teammates, Machiko Nishii, Yasuhiro Takahama and Koki Yasuda read out a statement he’d prepared, in Japanese, English, and Spanish. Jason Magness from Bend Racing/YogaSlackers is a gifted public speaker and he held the room, working well with Tarae the intern who was translating into Spanish by speaking short but pertinent sentences. He started by asking those in the room who were scared, to hold up their hands; there was quite a show of hands. He went on to explain that he feels that life is about storytelling; he likes to think of the lines on his face as stories and that PER is a race that etches new stories onto his face. Jason has raced a total of 171 expedition races and PER holds a special place in his psyche. “In the 2011 race that we finished 2nd, we used our thermarest pads to "swim" class II rivers instead of bushwhack, and nearly froze to death when we swam a 2km alpine lake trying to catch the Brits. The evening closed with a stand-up buffet that allowed the ten teams to mingle and compare notes on what lies ahead.